12 Year warranty; lifetime on cylinders. 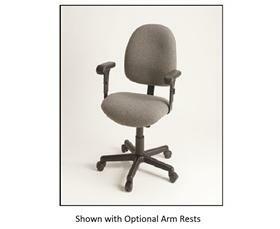 Provides maximum comfort and durability that increase worker productivity and reduces fatigue. Every Ergo Pro chair from Phillocraft is crafted with accentuated lumbar support, waterfall design seat, 2.7 lb./ 50 ILD premium quality foam. A full range of optional height and tilt mechanisms are available. HUP604 series has an angle-adjustable seat and back controlled with a single lever. The HUP704 series has an angle-adjustable seat and back controlled with two separate levers. Chairs come standard with either glides or casters. Rugged olefin fabric available in Blue, Black, Brown, Maroon and Gray - SPECIFY FABRIC COLOR IN COMMENTS SECTION WHEN ORDERING; Naugahyde brand vinyl available in Black and Gray. Optional foot rings and arm rests are also available for most models - please see Related Items tab below for available options. FOB Shipping Point. All seating components meet or exceed ANSI/BIFMA standards. Foam and fabric meet CA. Technical Bulletin #117 section E fire. UPS shippable.